Synopsis: When her father mysteriously disappears on an expedition, beautiful entomologist Gina Humphries and her fiery assistant, Rhonda, set out to search the rain forests of Belize. Due to numerous robberies and assaults in the jungle, they are escorted by heavily-armed soldiers. Guerillas, lead by the infamous Jaguar, ambush the convoy and incite a bloody shootout. Just when things can’t get worse, a horde of murderous Dragon Wasps, massive flying bugs that shoot flame from their abdomens, swarms the soldiers. 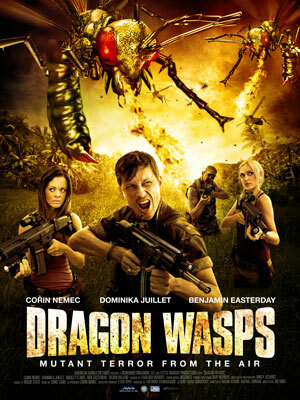 Now the military must defeat Jaguar’s bandits and survive the fearsome insect onslaught as they venture inside the Dragon Wasps’ hive.